For most parents, it’s common knowledge that when it comes to a child’s emotional, physical, and social development, screen time is something to limit. From birth until three, the frontal lobe is under major neurological construction so every experience teaches both how the real world works and how to live contently in it. So, why is it that when study after study tells us that screens stifle interaction, communication, concentration, and attention spans, moms and dads are handing over iPads in long lineups, popping DVDs on in the car, or turning TVs on while they get some things done around the house? DUH. (And yeah, I’m bringin’ back ‘duh’.) It’s not because they don’t love their kids and want the best for them. It’s because screens are often the fastest way to keep the peace. And while I’m not suggesting we eliminate family movie nights, delete a four-year-old’s favourite educational app, or never take another puppy-dog-filter selfie, I do have some peace-keeping ideas that are entirely off the grid. Who knows, your child might never beg for YouTube again. Anything’s possible, right? Whether it’s a road trip or a transatlantic flight, it’s tempting to rely on a screen to keep a little one content, but there are other options. 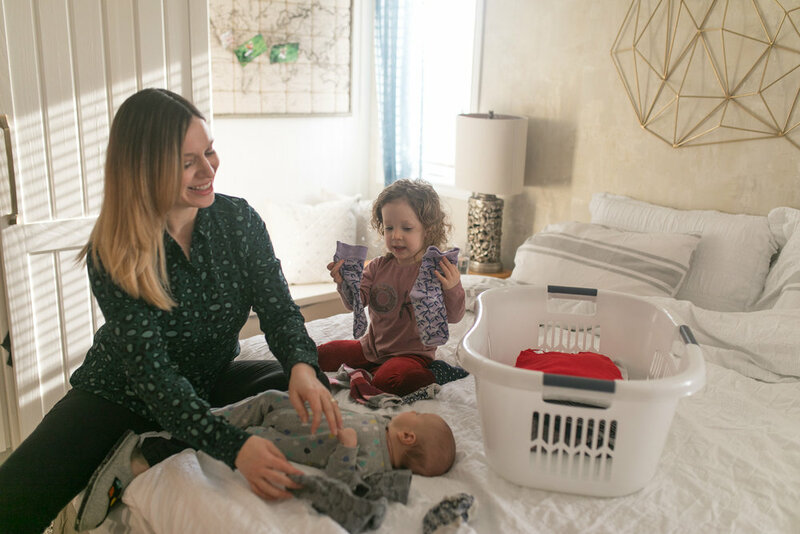 Pack a snack ‘n’ play bag from which you can pull building toys like Play Doh or Lego, interactive books like look-and-finds and mazes, drawing pads whether magnetic, dry erase, or otherwise, and of course, plenty of little snacks. Test their concentration and attention to detail with a game of eye spy, by counting cows, or by thinking of as many things that start with the letter ‘B’ as they can. And don’t underestimate the calming power of music. Before you set out on your adventure, create a playlist alongside your child to get them excited to hear their favourite songs and then, though sing-a-longs might not fly in an airplane, your kid will get a kick out of the whole family breaking into song in the car. Sick of the songs your kid loves? Try a book on CD! Sitting in a cart while your dad picks out produce for ages probably would get boring so I understand why so many little ones are holding tablets at the grocery store but as you probably know, kids love to help, even though sometimes their ‘help’ deserves to be in quotation marks. The answer here is to just let them. If you’ve got the time, show them how to tell which fruits are ripe and talk about what nutrients each veggie you’re choosing will nourish you with. And if you don’t have time, pop ‘em in the shopping cart and, minus the squishy and breakable stuff, let them be the middleman between you and that cart. For vehicle-bound errands like the car wash and oil change, turn to your travel tricks. I find the promise that my daughter can “be the one to pay” wraps any errand up on a high note. Dishes, laundry, supper prep, returning emails, getting ready to go out… you’ve got some things to do in a day. Some of this, the laundry and supper bits, can involve your child. When she was a newborn, I used to park my daughter, Petra by my clean laundry pile as I matched the socks in front of her, making a buzzer noise when I got it wrong and exclaiming with a “ding!” when I got it right. It wasn’t long before she could recognize the patterns and as soon as she was able, she played along, sorting my laundry for me! Doing dishes or cleaning the cat litter, on the other hand, aren’t exactly tasks that can involve a toddler. It’s at these times I put on a musical and we each choose a part to be, or I ask her to perform for her baby brother and I promising we’ll ‘be the audience’. Other peace-keepers include tracing her on a giant sheet of paper and telling her to draw the detail, pulling out the kinetic sandbox, half-shelling peanuts and letting her work at getting them out, or breaking out the stickers and tasking her with making a scene. Armed with alternatives and the will to try it out, the next time you need ten minutes to yourself and are tempted to press play on Paw Patrol, you can think outside the cable box and help your kid unplug. Disconnecting, they say, makes space for real connection and, bonus, it will make family movie night all the more special.